Social media use has also increased in emerging markets. 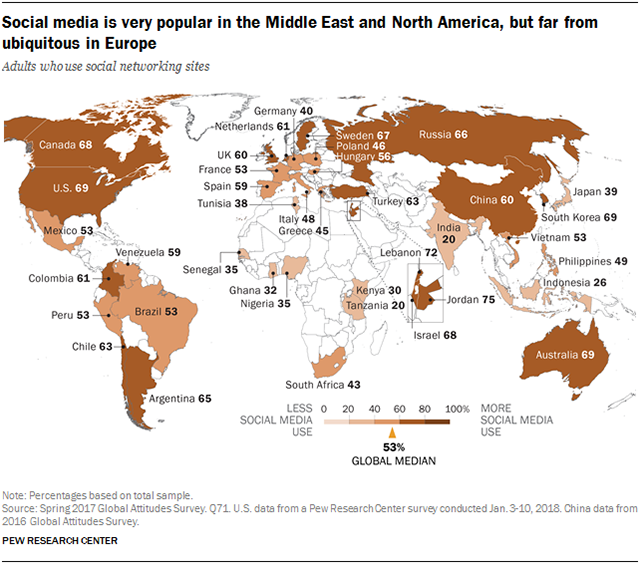 In 2015-16, roughly four-in-ten adults across the emerging nations surveyed said they used social networking sites. As of 2017, 53% use social media. 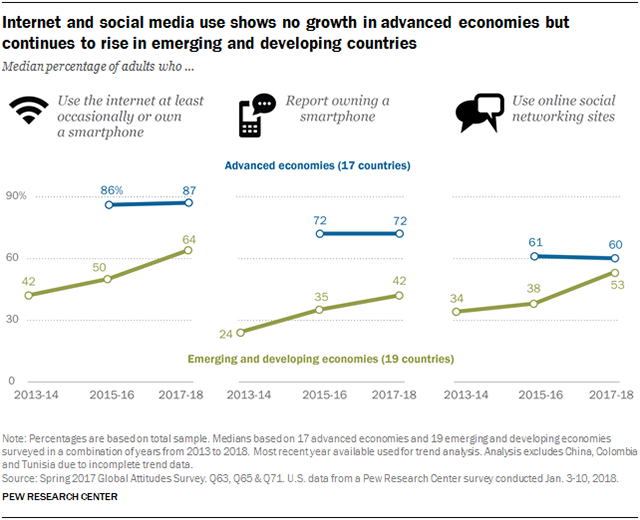 Over the same period, social media use has been generally level in many of the advanced economies surveyed. Despite growing internet use and smartphone ownership, the world remains digitally divided. It is still the case, for example, that people in wealthier countries have higher rates of internet use and smartphone ownership. However, among people who use the internet, those in developing countries often turn out to be more likely than their counterparts in advanced economies to network via platforms like Facebook and Twitter. Within countries, too, digital divides persist. Age, education, income and in some cases gender still differentiate who uses the internet and who does not, who is active on social media and who is inactive. These are among the major findings of a Pew Research Center survey conducted in 37 countries from Feb. 16 to May 8, 2017, among 40,448 respondents. It also includes analysis from Pew Research Center surveys conducted in the United States among 2,002 people in 2018 and in China among 3,154 people in 2016. While the gap in internet use between emerging and advanced economies has narrowed in recent years, there are still large swaths of the world where significant numbers of citizens do not use the internet. Internet penetration rates – as measured by internet use or smartphone ownership – remain high in North America and much of Europe, as well as in parts of the Asia-Pacific. Among the countries surveyed, South Korea stands out as the most heavily connected society, with 96% of adults reporting internet use. Yet, others are not far behind. In Australia, the Netherlands, Sweden, Canada, the U.S., Israel, the United Kingdom, Germany, France and Spain, roughly nine-in-ten report internet use. 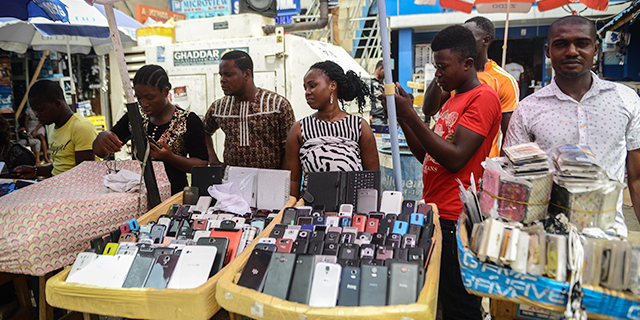 Internet use continues to lag in many developing economies. Only one-in-four Indians, for instance, report using the internet or owning a smartphone. Regionally, sub-Saharan Africa is one of the least wired parts of the globe. The global digital divide is largely an economic story. Richer countries, as measured by gross domestic product per capita (purchasing power parity), tend to have higher rates of internet use, while poorer countries tend to have lower rates. 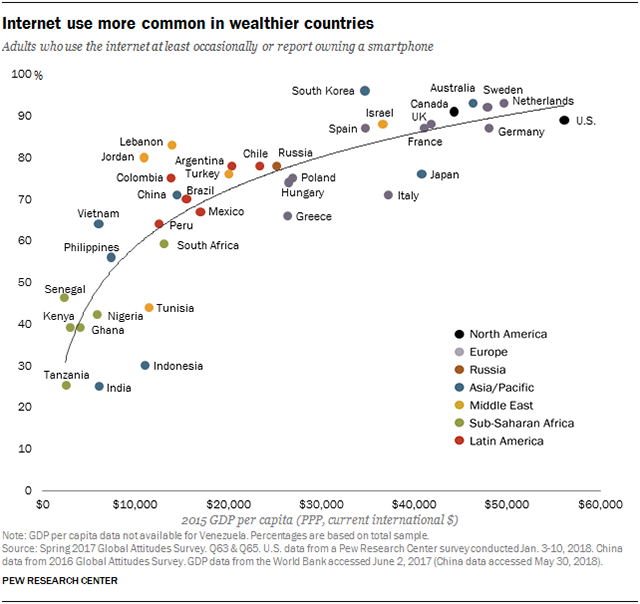 This pattern has been consistent across prior surveys and remains today for both internet use and smartphone ownership. Smartphones – mobile phones that can use the internet and access apps – are very common around the world. Across the 39 countries surveyed, a median of 59% report owning a smartphone, such as a Galaxy or iPhone (see Appendix B for country-specific details). A further 31% report owning another type of mobile device, such as a flip or feature phone. Only about one-in-ten (8%) across the 39 countries report having no mobile device at all. The pattern of smartphone ownership is similar to internet use, with people in wealthier countries exhibiting higher rates of ownership. But the gap in smartphone ownership is narrower than in the past, as many move directly from not owning a phone at all to owning a mobile device. Landline phones are simply being skipped by large numbers of people in emerging and developing markets. Despite the increasing levels of smartphone use, ownership still lags in India, Indonesia and Africa. Among these, only in South Africa do at least half report owning a smartphone. Social media is popular among many internet users. Usage rates are high in many of the advanced economies surveyed. This includes two-thirds or more of all adults in the U.S., Australia, South Korea, Canada, Israel and Sweden. But high rates of social media use are also found in emerging and developing economies. For example, 75% of adult Jordanians say they use social media; this means that of the eight-in-ten Jordanians who use the internet, 94% are active on social media platforms. Social media use is also widespread among internet users in the Philippines, Indonesia, Lebanon and Tunisia. In contrast, in some countries with high rates of internet use, relatively small shares of adults report using social media. In Germany, for instance, where 87% of people use the internet, less than half say they use social media. The interactive below provides data for levels of internet use, smartphone ownership and social media usage over time. All figures are based on total sample and include all data available for each year. You can also sort data by country.